Glenn Miller Vocals : Big band charts from the Glenn Miller Orchestra. A range of Glenn Miller vocals for solo vocalist or backing group. Born Alton G Miller, he was a trombonist, composer and band leader who was America's best-selling recording artist from 1939 to 1943. His band is remembered for the "Miller sound", using four tightly-scored saxophones under a clarinet lead. He joined the army in 1942, formed the 50 piece Army Air Force band, made many V-discs and recordings right up to his famous disappearance on December 15, 1944 whilst flying from England to entertain the troops stationed in Paris. Which are his most famous vocal charts? The Glenn Miller Orchestra had many vocal hits with singers such as Ray Eberle and with his vocal group, the "Modernaires", fronted by tenor player Tex Beneke" and vocalists such as Paula Kelly and Marion Hutton. 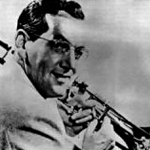 The best known Glenn Miller vocals are gems such as "Chattanooga Choo Choo", "Don't Sit Under the Apple Tree", "When Johnny Comes Marching Home" and "I've Got a Girl in Kalamazoo". The Glenn Miller Orchestra is still touring and performing worldwide.